Attorney Andrew Fischer of BikeAttorney.com has been awarded MassBike’s first-ever Paul Dudley White Lifetime Achievement Award. This award is bestowed for unyielding advocacy of bicycle safety and cyclists’ rights in Massachusetts. A renowned bicycle injury lawyer, Fischer is also a founding member, former president and long-time director of MassBike. He is also recognized as a pioneer of bicycle law in the Commonwealth. He personally penned legislation that protects cyclists from “dooring” and removed the legal loophole that gave negligent motorists a defense when they struck bicyclists passing on the right. 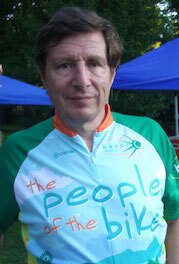 Fischer has been a bicycle safety advocate in the Bay State since the 1970s. He is now the first annual recipient of this prestigious award. Fries noted that while this seems like a simple matter, in truth it required “enormous bravery” to push back against the cultural tide of the time. While MassBike had numerous categories for honor, Fries explained the Paul Dudley White award is the “MVP” of them all. The award is named for the cardiologist who served President Dwight Eisenhower and sparked a bicycle renaissance when he prescribed cycling as a means of helping the president recover form an injury. Al Lima, a bicycle advocate, local historian and city planner for whom the Alfred J. Lima Quequechan River Trail is now named. When Fischer and these other advocates began their work more than 40 years ago, bicycles were a rare sight throughout Boston. There was roughly five miles of bike paths along the Charles River. There were no bike lanes, no rail trails, no bicycles allowed on the MBTA, very few signs that acknowledged cyclists and very few laws protecting those on bicycles. It’s hard to imagine that kind of atmosphere today, but it’s because of the tireless advocacy work of Fischer and others that we have seen such a dramatic change. Today, we have Complete Streets. There are Safe Routes to School. Bike cages are a common sight, as are protected bike lanes and more than 300 miles of bike paths throughout the state. Fries explained that Fischer as an attorney is a valuable asset to the community because he too “lives by the bike.” He understands the engineering challenges, and acutely understands the street-level dangers. The MassBike president added that for a long time, cyclists were – and sometimes still are – bullied. Fischer, he said, doesn’t tolerate bullies, and bicycle safety in Boston is better for it. Attorney Andrew Fischer fights for bicyclist rights. Call for a free and confidential appointment at 1-888-789 BIKE (2453).